Everywhere it’s Brisbane, Brisbane & more Brisbane! – the hottest place on the real estate planet if you believe the evening news; real estate junkies & local pollies. But how ‘hot’ is Brisbane really? This week, let’s peel back some layers & have a peak. The Brisbane residential market is in recovery. It crossed the threshold from trough to recovery in the second half of last year. But recent lifts in new dwelling & rental supply, plus relatively high levels of second-hand property for sale, have placed a brake on potential price & rental growth. These are cyclical issues, not structural ones. Brisbane is set to enjoy a much awaited upturn – an upturn in sales mostly; not much in the way of price or rental growth. There is a current need to build around 7,900 new dwellings in BCC each year. Yet over 9,000 new dwellings were approved during 2014. There are plenty more in the pipe-line, with some estimates exceeding 20,000 each year for the next three to five years. Ouch! 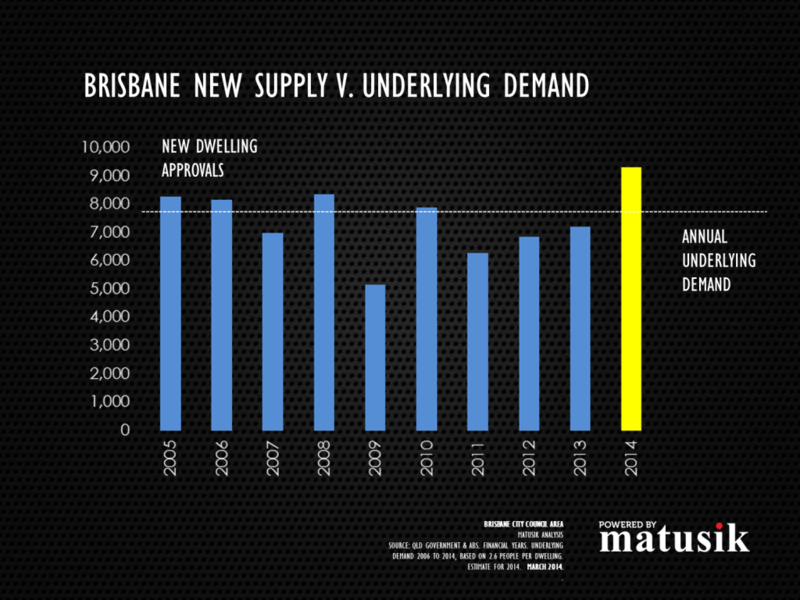 At present, most of Brisbane’s new housing starts are in medium-to-high rise developments. Such development is warranted (demographics; changing lifestyles; downtown gentrification; cost of living/travelling & even rent/housing prices), but the limitations on providing other attached housing supply (see here) are exacerbating the inner city apartment cycle. Since 2006, there has been a need to supply 63,000 new homes. The amount of new dwellings actually approved was 66,000. In short, the Brisbane housing market is at equilibrium. Whilst previously undersupplied – during 2009, 2011 to 2013 – the recent lift in new housing starts has more than filled this void. There are about 4,400 residential properties for rent across Brisbane City (20km radius from the Brisbane GPO) & this is more than doubled just two years ago. The city’s overall residential vacancy rate is rising & is now sits at 2.6%. The rapid rise in properties for rent is largely an inner city apartment issue; as already mentioned, supply has increased sharply in this area. Two-fifths of the properties for rent across Brisbane are in inner city suburbs, with 1,800 vacancies as at late February 2014. The inner city vacancy rate is 4%; it was 3.6% late last year & just 1.4% during much of 2012. 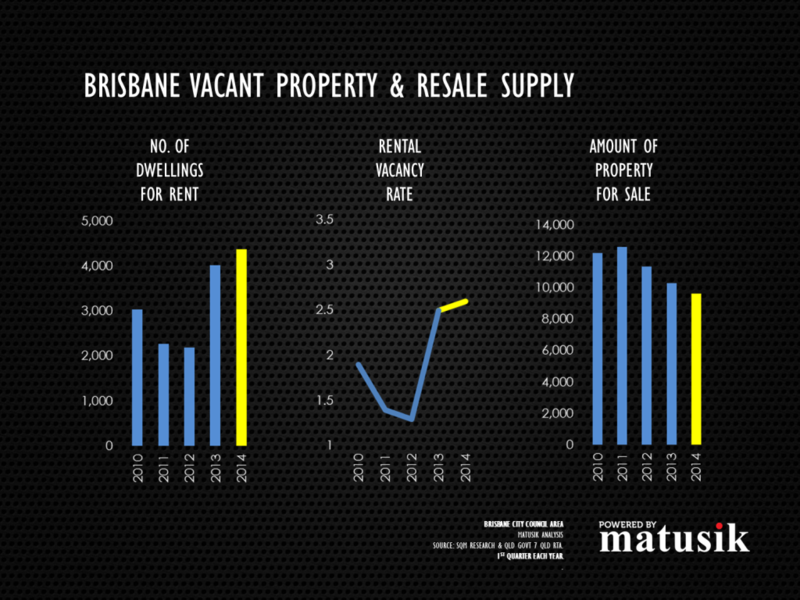 The Brisbane rental market is approaching equilibrium with a vacancy rate nudging 3%. Until this excess rental stock is absorbed – which, given the ramp up of new supply could take some years – rental growth, especially for second-hand apartments, will remain subdued. Rents are already starting to fall for Brisbane apartments. True, the amount of resale stock on the market is falling; but the decline (so far) has been quite slow. About 9,500 properties remain for sale, which presents about 3% of the total housing stock across the city. We should see resale stock levels fall across the city this year, which in turn should see some price growth for detached houses & infill compact housing. Apartment price growth, this cycle, is likely to lag. The new apartment market – particularly when it comes to those ugly monolithic towers downtown – is now a very crowded space. Investors need to buy into projects – and within them, an apartment – with a clear point of difference. The rising tide, this cycle, isn’t strong enough – like it was during 2001 to 2007 – to float all ships. Overseas & interstate investors, in particular, you have been forewarned. As I’ve explained Brisbane is, at best, going to have a sales-led recovery. 29,500 residential sales are forecast for fiscal 2014. We are anticipating 34,000 residential transactions during financial 2015 being: 1,400 land sales; 20,000 detached house sales & 12,600 attached dwelling transactions. Rising sales volumes have been steadily increasing since 2011. This is good news – and more sales need to happen – in order to absorb the high-ish amount of resale stock on the market. Rents are rising for houses; flat for attached dwellings & already falling for some apartments. Annual rent changes in Brisbane last year were: a drop of $10 per week for 1-bed apartments (-3%); -$10 per week for 3-bed apartments (-2%); No change for 2-bed attached & 2-bed houses; an increase of $5 per week for 3-bed attached (1%); + $10 per week for 3-bed houses (3%) & + $15 per week for 4-bed houses (3%). Already high volumes of new apartment supply are forcing rents down. Tenants can afford more rent – as our recent Brisbane Market Outlook Report suggests – but currently they have ample choice. Most price growth takes place during a property recovery & upturn – more on this topic next week – but during the recovery phase of the Brisbane cycle (calendar 2014), Brisbane’s residential prices aren’t likely to rise anywhere near as much as some are advocating. Current median residential prices for Brisbane (again, the Brisbane City Council area) are – $310,000 suburban vacant land; $546,000 detached house & $406,000 attached dwelling. We anticipate that these middle values could increase during 2014/15 to: $325,000 vacant land (up 5%); $580,000 detached house (up 7%) & just $412,000 attached dwelling (up 2%). When you boil it down to its core, property investment is ruled by two things – the cycle & structural changes. When it comes to things cyclical, Brisbane is in a recovery, but recovery in terms of price & rent growth is likely to be much milder than in the recent past. The supply-demand imbalance, plus some limits of local housing affordability – exacerbated by local low wage growth – is placing a limit on how far prices & rents can grow. We anticipate values to rise somewhere close to 15% (in total) for detached houses & infill compact dwellings during the recovery & upswing (calendar 2014 & 2015 respectively) phases of the Brisbane cycle. We think this market will peak in early to mid-2016. Price growth beyond these limits could see a harder downturn (late 2016 to 2018) than might otherwise be the case. Some readers may deduce from this that detached houses are a better investment. For a range of structural reasons, this may not be the case. Demographics & value (affordability) are the two major structural influences. 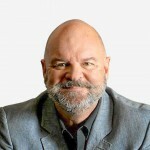 True, there is more short-term upside for detached houses in Brisbane, but for mine, the longer-term safer bet is for an investor to buy something attached & somewhat unique, which has the capacity to be shared by tenants & sold – in time – to an owner-resident.